With such old school favorites as Naughty By Nature, House of Pain, 2-Pac, and Busta Rhymes mixed with new hotness like Kanye West, Flo Rida, Eminem, and Sean Paul there's surely something for everyone in this game. You can even preview all the tracks - in 30 second bites - on the official DJ Hero 2 website. All of these tracks are mixed by famous DJs like Tiesto, DJ Jazzy Jeff, and DJ Z-Trip. Sadly like the first game, there's no official word on an actual soundtrack release - though pre-ordering the game does get you access to a few MP3s of songs in it. 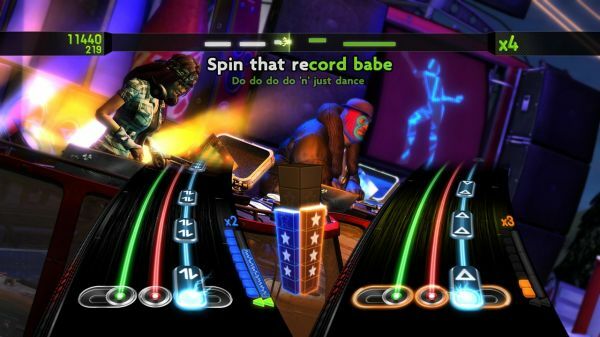 DJ Hero 2 is out on October 5th with a 3 player co-op mode for two turn tables and a microphone (a song sadly missing from the game) on the Xbox 360, PlayStation 3, and Nintendo Wii. Young Jeezy ft. Kanye West - "Put On" Mixed With DJ Shadow feat. Q-Tip and Lateef The Truth Speaker - "Enuff (DJ Fresh Remix)"
David Guetta & Chris Willis - "Love Is Gone" Mixed With Sam Sparro - "B&G" a/k/a "Black & Gold"
Snow - "Informer" Mixed With Jackson 5 - "ABC"
Tiesto & Sneaky Sound System - "I Will Be Here" Mixed With Tiesto - "Speed Rail"
Tweet ft. Missy Elliott - "Oops (Oh My)" Mixed With Snoop Dogg - "Who Am I (What's My Name)?"